24 March 2019 - Bafana Bafana have qualified for the Africa Cup of Nations in Egypt in scintillating fashion. 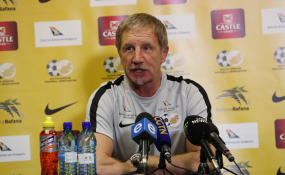 Going into this final AFCON2019 encounter on Sunday 24 March 2019, Stuart Baxter's boys played one of the greatest games ever by the Senior Men's National Team. And the toast of the trip to Egypt in June in Sunday evening's game was star striker Percy Tau whose big game temperament is well documented. The speedy striker scored with five minutes into the second half to give South Africa the advantage although Libya equalised with a controversial penalty kick, Tau and his colleagues were never going to be denied on a hostile evening. Tau's first goal was a cracker from just outside the box while his second had pace and precision that gave the Libya goalkeeper no chance. The victory will rank among one of the best victories for South Africa and as they head to Egypt for AFCON finals, they will get there with a good chance of leaving a lasting impression in the North of Africa. If anything, almost all of the players put their weight on this victory; starting with outstanding goalkeeper Darren Keet who had a blinder of a game thwarting Libya in the first half now and again. The back four, well marshalled by captain Thulani Hlatshwayo resembled the old Berlin Wall in which Sfiso Hlanti, Buhle Mkwanazi and Mkhize as well as Innocet Maela put their bodies on the line. Dean Furman was a tiger in the midfield so was Kamohelo Mokotjo, while Themba Zwane and Mothiba never stopped running. What sweet victory it was and coming hot on the heels of almost all of South Africa's national teams qualifying for major tournaments.